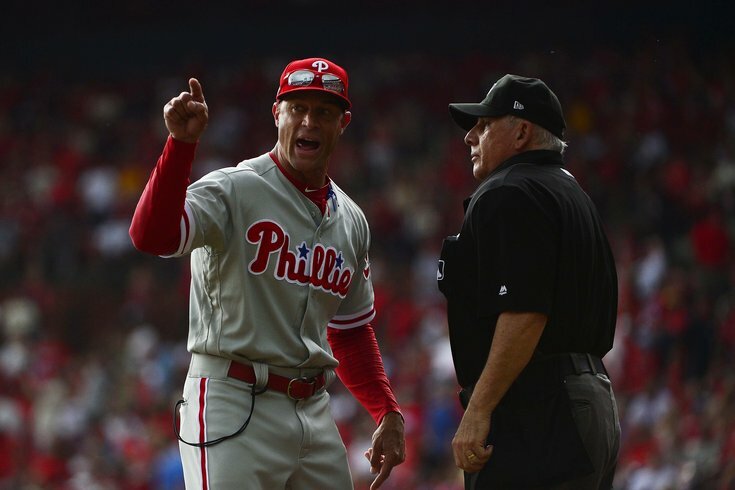 Philadelphia Phillies manager Gabe Kapler argues with umpire Larry Vanover after a rain delay was issued during the fifth inning against the St. Louis Cardinals. The Philadelphia Phillies are one of the best teams in baseball. At least that's what some people are saying. But can that really be true? Or is it too early to tell? Even after a 5-1 loss to the Cardinals Sunday (a game that saw them collect just two meager hits), they sit a game and a half behind the Atlanta Braves in the NL East, and with a win in their series final on move to 10 games over .500 for the first time since 2011, when they won 102 games. Power Rankings Roundup: Phillies are on the rise – so how high did they climb? At 26-18, they have the third best record – and run differential (+35) – in the National League and have the second best home record in all of baseball. They have an early Cy Young candidate in Aaron Nola and an MVP candidate in Odubel Herrera, whose on-base streak ended Sunday at 45 games (his reach on a dropped third strike didn't count). Carlos Santana is just starting to turn it on and first-year manager Gabe Kapler is no longer the punchline. Oh, and that pesky closer situation that won't seem to go away? The Phils may be close there as well. On Saturday, 23-year-old reliever Seranthony Dominguez picked up a six-out save – the first save of his young career – in his first opportunity. In six appearances (6.2 IP) this season, the hard-throwing righty has struck out seven batters without surrendering a single hit or walk (although he did hit one batter, his only baserunner allowed). Winners of eight of their last 11 games, no one in baseball is as hot as the Phillies. And, sure, it may be early – we've only just passed the quarter poll of the season, after all – but it's certainly worth asking the question: Just how good is this team? If you're not buying the Phillies as a legit contender, Cody Benjamin of CBSSports.com doesn't have time for you. And as he points out, it's not just Nola and Herrera who have been playing well. The Philadelphia Phillies are one of the best teams in baseball. Many thought the biggest improvements to the roster would come in the form of a pair of big free agent signings the Phillies made this offseason. As Ryan Fagan of the Sporting News points out, however, their biggest boosts have been coming from the development of talent that was already on the roster. Those two alone [free agents Carlos Santana and Jake Arrieta], though, wouldn’t have been nearly enough to turn a 66-win team into a playoff contender. Not even the rosiest of rose-colored glasses saw that happening. To become a legitimate playoff contender, the Phillies needed the talented but raw/inconsistent/learning youngsters who were on the roster during that 66-win season to take a giant step forward. If you’ve watched the Phillies at all — well, after the opening series in Atlanta — you know that’s happened. After an impressive 6-2 win over the Cardinals in the shadow of the Gateway Arch on Thursday, they’re 25-16, just a half-game behind the Braves in the NL East. In all of baseball, only the Yankees, Red Sox, Astros and Braves have better records than the Phillies. Fagan's main takeaway, though? "The Phillies are for real, folks." While Inquirer baseball columnist Bob Brookover agrees that it's "absolutely not" too soon to declare the Phillies contenders, general manager Matt Klentak isn't quite there yet. As general manager Matt Klentak discussed the Phillies’ work through the first quarter of the season Tuesday night in Baltimore, he sounded like a driver doing what he’s supposed to do at a yellow light. And it seems the previous Sporting News item only further supports Klentak's point. The Phillies are another team that could go many different ways. They could look to the closing job since Hector Neris lost that full-time gig following a few blown saves; they could augment a rotation that hasn’t been bad at all; or, they could consider right field and/or a left-side infield position for upgrade. The closer seems like the most pressing issue at the moment, but they’d please a lot of people if they’d consider bringing back the beloved Cole Hamels (probably a long shot). Shortstop J.P. Crawford wasn’t off to a great start before going down with an injury, and we all know how much the Phillies executives – almost all of whom were in Baltimore when Manny Machado was selected third overall – love Machado. They also love Zach Britton from Baltimore days, and he’d fit as well.